Provide the most relevant education and communication programs and activities that link the full spectrum of healthcare decision-makers and stakeholders in support of the delivery of quality, cost-effective healthcare. Assist pharma, biotech, and device manufacturers with understanding the perspectives of payers challenged with assessing and determining the total effectiveness of their products. Deliver relevant and differentiating programs that address the clinical, economic, and administrative needs of healthcare decision-makers managing diverse populations. Create and foster internal implementation strategies by recognizing and managing the unique needs of internal clients. Address critical issues impacting the overall business of healthcare. Our long history and deep experience across payer channels allows us to keep pace with evolving dynamics and tap into decision-maker perspectives, thereby allowing us to develop quality, informational programs that are truly value added instead of value expected. SHA is experienced in a wide range of disease states and with products throughout their life cycle. Therapeutic areas in which we are knowledgeable include (but are not limited to) cardiology, hematology, neurology, endocrinology, immunology, oncology, respiratory, inflammatory, and gastrointestinal disorders, as well as a myriad of rare and ultra-rare diseases. Our focus is also on issues related to the business of healthcare such as healthcare reform, emerging and evolving care models and reimbursement strategies, quality coordinated-care delivery, and comparative effectiveness research, among many others. Our staff has years of combined managed markets experience in program strategy and pull through, content development and delivery, and meeting facilitation and management. 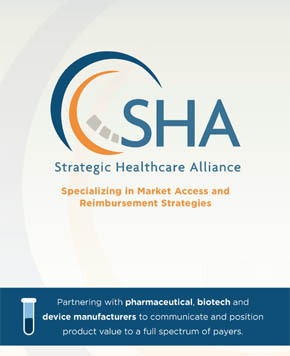 SHA offers a full breadth of services to meet your specific needs, including (but not limited to) strategic consulting, market research, value proposition development, advisory boards/roundtables, access management training, media planning, virtual conferences, publications, and much more. We also maintain a proprietary database of key healthcare decision-makers who provide us with strategic insights on current issues, trends, and challenges that affect them on a daily basis. ©2019 Strategic Healthcare Alliance, LLC. All rights reserved.